There are many ways to be involved with Christmas House to help provide gifts for needy children. You can donate money or new gifts; make gifts; volunteer your time, vehicles or storage space; donate store items such as tables and tarps; provide lunch and beverages for volunteers; host a donation barrel at your place of business during Nov/Dec; or hold a fundraiser or gift drive to benefit Christmas House. See the information below, or email president@christmas-house.org. Help us share ideas of how to help Christmas House. Print a bookmark of the information presented on this page and share it with family, friends and coworkers. Make an online donation using The Network for Good (WA state residents only). Shop online at smile.amazon.com (the same great prices and selections as amazon.com), choose Christmas House as your organization, and Amazon will donation a portion of the purchase price (5%) to Christmas House at no extra cost to you. Find more Q&As online at http://smile.amazon.com/about … or just visit www.smile.amazon.com, select Christmas House and start shopping! Link your Fred Meyer Rewards Card to Christmas House. Fred Meyer stores in Alaska, Idaho, Oregon and Washington will donate money to Christmas House each time a customer uses their Rewards Card and has gone online to designate Christmas House as the recipient. (www.fredmeyer.com/communityrewards – search by our name or 88943). You still earn your usual Rewards points and benefits, PLUS now can benefit Christmas House, too. Sign up today! Join iGive.com, which has links to 1,700 internet shopping sites. Christmas House earns money when you make purchases from these retail sites. You can join iGive.com (free) and designate Christmas House as your charity to receive a commission from your purchases. It’s simple and easy … after you join and download the button, it will appear on the many participating websites whenever you visit their site. Shop using StadiumFlowers.com and select Christmas House as your charity on the checkout page and we will receive $2 for each purchase. Christmas House is not a United Way agency, but the United Way distributes funds to non-affiliated agencies, when they are designated. If your company uses United Way for its workplace campaigns you can still donate to us by designating your dollars specifically to Christmas House. The number assigned to Christmas House is 9560. Boeing employees can donate to Christmas House through the Employee Community Fund, by designating the money to Christmas House. Our identification number is A-18525. Microsoft employees who volunteer 10 or more hours in 12 months can log their hours with the company Volunteer Match Program and Christmas House will receive $17 for each hour they volunteered with us. Microsoft employees can make donations to Christmas House through their company (minimum donation of $25). State, federal or local government employees in the State of Washington, using Local Independent Charities or Combined Federal Charities for workplace campaigns, may designate donations to Christmas House. 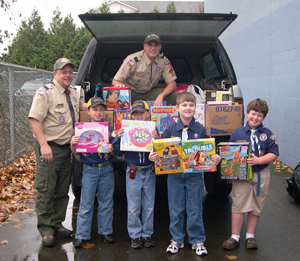 When the Christmas House “store” is open in December (see calendar on the Volunteer page), gift donations may be brought to the Boys & Girls Club gym at 2316-12th Street, Everett, WA, during any of our open hours. During the rest of the year, please email donations@christmas-house.org to make delivery arrangements, or phone 425-338-2273 (we are not at the gym location year-round). Judd & Black held their annual charity golf tourney at Battle Creek Golf Course in Marysville and donated $8,000 to Christmas House. Employees from the Snohomish County Info. Services Dept. put on a turkey dinner for staff and all proceeds ($1,848) were donated to Christmas House. The Goldwing Touring Association (GWTA) Chapter C, Evergreen Wings motorcycle club held their annual Fun Run Motorcycle Ride and donated proceeds to Christmas House. Their efforts raised $1,000. 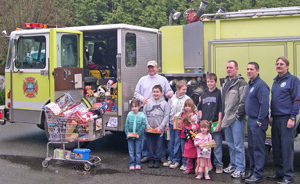 In addition to volunteering while the store is open to shoppers, they also held a toy and clothing drive. Sterling Savings Bank (formerly Golf Savings Bank) in Mountlake Terrace held a combination pancake breakfast / bake sale / pie-throwing contest among their employees and customers. These endeavors raised $4,055 for Christmas House. Perteet, Inc., a consulting engineering firm in Everett, held a piggy bank decorating contest and collection among their employees. Perteet then matched their employee donations giving a total of $1,092 to Christmas House. Twenty-six Penny Creek Elementary second-grade students spent a $10 grant on art supplies so they could make posters announcing their effort to collect hats, gloves and earmuffs for Christmas House. Donations boxes were set up at the school and at the end of their efforts they were excited to donate 2,027 items to Christmas House. Are you interested in placing a collection box at your place of business during November and December to collect new gifts for Christmas House? Here’s how you can help us . . .
deliver the collected gifts/toys to us at our “store” location four or more days before we close (view calendar on the Volunteer page). If your donation site is open to public contributions, let us know and we’ll add your location to our website listing. During November and December, you can view the list from the link on our sidebar.